Official publication of the International Congress of Oral Implantologists (ICOI), the Danish Society for Oral Implantology (DSOI), and the Portuguese Society of Implantology and Osseointegration (SOPIO). Im Abonnement enthalten ist ein kostenloser Online-Zugang zum aktuellen und zu allen seit 2008 erschienenen Jahrgängen. Zusätzlich können Abonnenten die kostenlose App 'Quintessence Journals' nutzen. 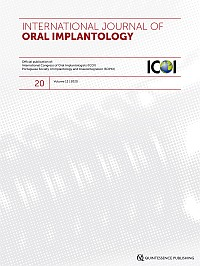 The "International Journal of Oral Implantology" prides itself on presenting evidence-based, practical insights into oral implantology and related disciplines to specialists and general practitioners alike. Under the guidance of the highly regarded editorial board, the journal encompasses systematic reviews, clinical trials and clinical studies, with a focus on randomised controlled trials of quality and substance. Full descriptions and relevant illustrations are included so that clinicians can fully understand all the procedures presented. The aim of this journal is to provide reliable clinical guidance to practitioners to help them make the best decisions possible for their patients. Purpose: The purpose of this study was to evaluate the role of keratinised mucosa on the long-term success of dental implants. Materials and methods: Thirty-two edentulous patients had one of their dental arches rehabilitated with a provisional screw-retained resin reinforced cross-arch fixed prosthesis supported by four immediately loaded implants. The two central straight implants were randomly allocated in two equal groups, according to a parallel-group design, to receive or not intermediate abutments (Multi-Unit Abutment, MUA). However, for the purpose of the present publication, the study was considered as a prospective single cohort study. To be immediately loaded, implants had to be inserted with a minimum torque of 30 Ncm, which was achieved by all implants. Provisional prostheses were delivered within 24 hours and were replaced, after 4 months, by definitive screw-retained metal-ceramic prostheses. Patients were followed up to 5 years after loading. Prostheses were removed every 8 months to facilitate professionally delivered maintenance. Outcome measures were prosthesis and implant failures, complications, peri-implant marginal bone level (MBL) changes, bleeding on probing (BoP) and keratinised mucosa height (KMH). The absence of vestibular or lingual keratinised mucosa was put in relation with peri-implant bone loss and BoP. Results: Five-years after loading two patients dropped out and no implant or prosthetic failure occurred. Four patients were affected by prosthetic complications. At delivery of definitive prostheses, 32 (25%) implants had at least one vestibular or lingual site with no KMH and 96 (75%) implants had both sites with some KMH. Multi-level models did not show any statistically significant association between KMH at the time of delivery of the definitive prosthesis and changes in MBL and BoP at 5 years (estimate = 0.02; 95% CI: -0.02 to 0.05; P = 0.3393; and 1.02; 95% CI: 0.79 to 1.33; P = 0.8695, respectively). When KMH was analysed as dichotomous variable, implants with presence of KMH at delivery of definitive prosthesis at both vestibular and lingual aspects showed a trend of less BoP (estimate = -0.8; 95% CI: -1.69 to 0.08; P = 0.0741) but a statistically significant greater MBL loss compared to implants where KMH was only present at one site (estimate = 0.18; 95% CI: -0.1 to 0.3; P = 0.0041). Conclusions: The 5-year after loading outcome of immediately loaded screw-retained cross-arch prostheses supported by four implants is excellent in both the maxilla and mandible. Although the height of the keratinised mucosa did not seem to alter the clinical outcomes, its presence both at vestibular and lingual sites was associated with an increased marginal bone loss when compared to implants having at least one side without keratinised mucosa. Conflict of interest statement: This study was completely self-funded and the authors declare not to have any conflict of interest. Purpose: To evaluate whether 5-mm short dental implants could be an alternative to augmentation with anorganic bovine bone and placement of at least 10-mm long implants in posterior atrophic jaws. Materials and methods: Fifteen patients with bilateral atrophic mandibles (5 to 7 mm bone height above the mandibular canal) and 15 patients with bilateral atrophic maxillae (4 to 6 mm bone height below the maxillary sinus), and bone thickness of at least 8 mm, were randomised according to a split-mouth design to receive one to three 5-mm short implants or at least 10-mm long implants in augmented bone. Mandibles were vertically augmented with interpositional bone blocks and maxillary sinuses with particulated bone via a lateral window. Implants were placed after 4 months, submerged and loaded, after another 4 months, with provisional prostheses. Four months later, definitive provisionally cemented prostheses were delivered. Outcome measures were: prosthesis and implant failures, any complication and peri-implant marginal bone level changes. Results: In five augmented mandibles the planned 10-mm long implants could not be placed and shorter implants (7.0 and 8.5 mm) had to be used instead. Five years after loading, six patients, five treated in the mandible and one in the maxilla, dropped out. Three prostheses (one mandibular and two maxillary) failed in the short-implant group versus none in the long-implant group. In mandibles one long implant failed versus two short implants in one patient. In maxillae one long implant failed versus three short implants in two patients. There were no statistically significant differences in implant (n = 26; P = 1.00, difference = 3.85%, 95% CI: -12.95% to 20.64%) and prosthetic (n = 26; P = 0.250, difference = 11.54%, 95% CI: -0.74% to 23.82%) failures. Eleven patients had 16 complications at short implants (one patient accounted for six complications) and 12 patients had 14 complications at long implants. There were no statistically significant differences in complications (n = 28; P = 1.00, difference = -3.57%, 95% CI: -30.65% to 23.51%). Five years after loading, patients with mandibular implants lost on average 1.72 mm at short implants and 2.10 mm at long implants of peri-implant marginal bone. This difference was statistically significant (difference = 0.37 ± 0.43 mm; 95% CI: 0.07 to 0.68 mm; P = 0.022). In maxillae, patients lost on average 1.31 mm at short implants and 1.79 mm at long implants. This difference was statistically significant (difference = 0.48 ± 0.43 mm; 95% CI: 0.22 to 0.74 mm; P = 0.002). Conclusions: Five years after loading, 5-mm short implants achieved similar results to longer implants in augmented bone. The choice of short implants might be preferable to vertical bone augmentation, especially in mandibles, since the treatment is faster and cheaper. Conflict-of-interest statement: MegaGen Implant, Gyeongbuk, South Korea, partially supported this trial and donated the implants and prosthetic components. However, data properties belonged to the authors and MegaGen Implant Co. did not interfere with the conduct of the trial or the publication of the results. Purpose: To evaluate whether 5 × 5 mm dental implants with a novel nanostructured calcium-incorporated titanium surface could be an alternative to implants at least 10-mm long placed in bone augmented with bone substitutes in posterior atrophic jaws. Materials and methods: Forty patients with atrophic posterior (premolar and molar areas) mandibles having 5- to 7-mm bone height above the mandibular canal, and 40 patients with atrophic maxillae having 4- to 6-mm bone height below the maxillary sinus, were randomised according to a parallel-group design to receive one to three 5-mm implants or one to three at least 10-mm long implants in augmented bone at two centres. All implants had a diameter of 5 mm. Mandibles were vertically augmented with interpositional bovine bone blocks covered with resorbable barriers. Implants were placed after 4 months. Maxillary sinuses were augmented with particulated porcine bone via a lateral window covered with resorbable barriers and implants were placed simultaneously. All implants were submerged and loaded after 4 months with provisional prostheses. Four months later, definitive screw-retained or provisionally cemented metal-ceramic or zirconia prostheses were delivered. Patients were followed to 5 years post-loading and the outcome measures were: prosthesis and implant failures, any complication and peri-implant marginal bone level changes. Results: Sixteen patients dropped out before the 5-year evaluation (four short mandibles, three short maxillae, six augmented mandibles and three augmented maxillae). In mandibles, two grafted patients were not prosthetically rehabilitated because of multiple complications, and three implants failed in the same patient (one was a replacement implant) versus one patient who lost his short implant and crown 2 years after loading. In maxillae one short implant failed with its provisional crown 3 months post-loading. There were no statistically significant differences in prostheses (difference in proportion = -0.003; 95% CI: -0.14 to 0.13; P = 1.000) and implant failures (difference in proportion = -0.03; 95% CI: -0.17 to 0.09; P = 0.609) up to 5 years after loading. Significantly more complications occurred at mandibular grafted sites: 17 augmented patients were affected by complications versus nine patients treated with short implants in mandibles (difference in proportion = 0.39; 95% CI: 0.10 to 0.62; P = 0.013). In the maxilla seven sinus-elevated patients versus two patients treated with short implants were affected by complications, the difference not being statistically significant (difference in proportion = 0.25; 95% CI: -0.04 to 0.49; P = 0.128). Patients with mandibular short implants lost on average 1.22 mm of peri-implant bone at 5 years and patients with 10-mm or longer mandibular implants lost 1.70 mm. Patients with maxillary short implants lost on average 1.25 mm of peri-implant bone at 5 years and patients with 10-mm or longer maxillary implants lost 1.73 mm. Longer implants showed a greater bone loss up to 5 years after loading than short implants both in maxillae (mean difference: -0.48 mm; 95% CI: -0.89 to -0.07 mm; P = 0.024) and in mandibles (mean difference: -0.48 mm; 95% CI: -0.79 to -0.18 mm; P = 0.004). Conclusions: Five years after loading, 5 × 5 mm implants achieved similar results to longer implants placed in augmented bone. Short implants might be a preferable choice to bone augmentation especially in posterior mandibles since the treatment is faster, cheaper and associated with less morbidity; however, 10-year post-loading data are necessary before making reliable recommendations. Conflict of interest statement: MegaGen (Implant, Gyeongbuk, South Korea) partially supported this trial and donated implants and prosthetic components used in this study. Tecnoss (Giaveno, Italy) donated the bone substitutes and the barriers. Data property belonged to the authors and the manufacturers did not interfere with the conduct of the trial or the publication of its results. Purpose: To evaluate whether 6-mm-long by 4-mm-wide dental implants could be an alternative to implants at least 10-mm long placed in bone augmented with bone substitutes in posterior atrophic jaws. Materials and methods: A total of 20 patients with bilateral atrophic mandibles and 20 patients with bilateral atrophic maxillae, having 5 to 7 mm of bone height below the maxillary sinus or 6 to 8 mm above the mandibular canal, had their sides of the jaws randomly allocated according to a split-mouth design. They were allocated to receive one to three 6-mm-long and 4-mm-wide implants, or implants at least 10-mm long in augmented bone by two different surgeons in different centres. Mandibles were vertically augmented with interpositional equine bone blocks and resorbable barriers, and implants were placed 3 months later. Maxillary sinuses were augmented with particulated porcine bone via a lateral window and implants were placed simultaneously. All implants were submerged and loaded, after 4 months, with provisional prostheses. Four months later, definitive prostheses were delivered. Outcome measures were prosthesis and implant failures, any complication and radiographic peri-implant marginal bone level changes. The follow-up was 5 years after loading for all patients. Results: Eight patients (five treated in mandibles and three in maxillae) dropped out before the 5-year post-loading follow-up. Four short implants (two maxillary and two mandibular) affected by peri-implantitis failed together with their prostheses versus three mandibular prostheses which could not be placed on implants at least 10-mm long due to graft failures; one was associated with the loss of three implants because of infection. There were no statistically significant differences in implant (P = 1.0) and prosthesis failures (P = 1.0). In total, 19 complications occurred in 14 patients at augmented sites versus five complications in four patients with 6-mm-long implants (P = 0.118). More complications occurred at grafted sites both in mandibles (P = 0.727), and maxillae (P = 0.063), although the differences were not statistically significant. In mandibles, patients with 6-mm-long implants lost an average of 1.34 ± 0.35 mm of peri-implant bone at 5 years versus 2.11 ± 0.59 mm in patients with implants at least 10-mm long. The difference was statistically significant (mean difference = 0.77 ± 0.70 mm; 95% CI: 0.32 to 1.21 mm; P = 0.003). In maxillae, patients with 6-mm-long implants lost an average of 1.52 ± 0.47 mm of peri-implant bone at 5 years versus 1.85 ± 0.51 mm in patients with implants at least 10-mm long. The difference was statistically significant (mean difference = 0.33 ± 0.36 mm; 95% CI: 0.14 to 0.53 mm; P = 0.002). Conclusions: Results at 5 years after loading indicate that 6-mm-long implants with a conventional diameter of 4 mm achieved similar results to longer implants placed in augmented bone. Short implants might be a preferable choice to bone augmentation, especially in posterior mandibles since the treatment was faster, cheaper and associated with less morbidity. However, 10-year post-loading data are necessary before making reliable recommendations. Conflict of interest statement: Tecnoss and Southern Implants partially supported this trial and donated biomaterials, implants and prosthetic components used in this study. However, the data belonged to the authors and by no means did the manufacturers interfere with the conduct of the trial or the publication of its results. Purpose: To compare the outcome of tooth extractions in patients taking oral antithrombotic without reducing their dose. Four different interventions were compared within the same patient: suturing alone (control group), suturing plus a haemostatic plug, suturing plus advanced-platelet-rich fibrin (A-PRF+) plug, and suturing plus leukocyte- and platelet-rich fibrin (L-PRF) plug into the socket. Materials and methods: Forty patients, taking oral antiplatelet agents, requiring the extraction of at least four non-adjacent teeth were selected for the study. After extractions the sockets were randomly allocated to suturing alone (control group), suturing plus haemostatic plug (HAEM), suturing plus advanced-platelet-rich fibrin (A-PRF+) plug, and suturing plus leukocyte- and platelet-rich fibrin (L-PRF) plug into the socket without reducing the dose of oral antiplatelets according to a split-mouth design. Outcome measures were complications, time to complete each procedure, postoperative bleeding, costs of the materials, patient preference and a wound healing index recorded 1 and 2 weeks postextraction by blinded assessors. Results: Two weeks after extraction no patient dropped out and no complication was reported. The average time to complete suturing after tooth extractions was: 1.0 ± 0.00 minutes at control sites, 1.5 ± 0.41 at HAEM sites, 2.8 ± 0.61 at A-PRF+ sites, and 2.8 ± 0.56 at L-PRF sites, the difference being statistically significant between each pairwise comparison except A-PRF+ vs L-PRF. Postoperative bleeding 30 minutes after extractions was present at 8, 5, 1 and 2 sites for control, HAEM, A-PRF+ and L-PRF sites, respectively. A-PRF showed statistically significantly less bleeding compared to the control group (odds ratio = 0.1 (95% CI [0.01;0.86]; P < 0.0361). In all cases bleeding was moderate in nature and not severe. One week after extractions the mean wound healing index was 1.05 ± 0.60 for control, 1.18 ± 0.59 for HAEM, 1.00 ± 0.68 for A-PRF+ and 0.95 ± 0.50 for L-PRF sites. No statistically significant difference was detected across groups (P = 0.633). Two weeks after extractions the mean wound healing index was 0.33 ± 0.53 for control, 0.43 ± 0.50 for HAEM, 0.25 ± 0.49 for A-PRF+ and 0.15 ± 0.36 for L-PRF sites. No statistically significant difference across groups was detected (P = 0.255). One week after extractions, nine patients preferred control sites, eight HAEM, ten A-PRF+, four L-PRF and nine had no preference. No statistically significant differences were detected for control sites (P = 0.6779), HAEM (P = 1.0000), A-PRF+ (P = 0.4055) and L-PRF (P = 0.1472). Two weeks after extractions five patients preferred control sites, three HAEM, eight A-PRF+, eight L-PRF and 16 had no preference. No statistically significant differences were detected for control sites (P = 0.8147), HAEM (P = 0.2363), A-PRF+ (P = 0.3488) and L-PRF (P = 0.3488). Costs without counting sutures and blood centrifuges were 0.00, 14.49, 2.44 and 2.44 Euro for control, HAEM, A-PRF+ and L-PRF sites, respectively. Conclusions: It may not be necessary to discontinue the use of oral antiplatelets in patients undergoing dental extractions and, when present, the minor statistically significant differences between procedures were not clinically relevant; therefore clinicians can use any of the tested interventions according to their preference, keeping in mind that simple suturing is sufficient and is faster and cheaper, and that A-PRF+ was associated with less postoperative bleeding when compared to suturing alone. Conflict of interest statement: This trial was not funded by any institution or commercial organisation and the authors declare no conflict of interests. Purpose: To evaluate the outcome of one (fixed-on-1, Fo1) versus two (fixed-on-2, Fo2) implants placed flapless in fully edentulous mandibles and immediately restored with metal-resin screw-retained cross-arch prostheses. Materials and methods: Twenty patients with edentulous or to be rendered edentulous mandibles were randomised to the Fo1 group (10 patients who received three intraforaminal implants but only the mesial implant was actually loaded) and to the Fo2 group (10 patients who received two intraforaminal implants) according to a parallel-group design. To be immediately loaded implants had to be inserted with a minimum torque of 60 Ncm. Outcome measures were prosthesis and implant failures, complications and patient satisfaction for function and aesthetics evaluated up to 10 months post-loading. Results: Flaps were raised in three patients of the Fo1 group and one of the Fo2 group. Two prostheses in each group were delayed loaded at 2 and 3 months, because implants could not be inserted with a torque superior to 60 Ncm. Patients of the Fo2 group received prostheses with 12 teeth whereas Fo1 patients with 8 or 10 teeth. Ten months after loading no drop-out or implant failure occurred, but one Fo2 prosthesis had to be remade because the patient complained it was too short (risk difference = 0.1; 95% CI: -0.19 to 0.40; Fisher's exact test P = 1.000). Three patients were affected by complications in each group (risk difference = 0.0; 95% CI: -0.359 to 0.359; Fisher's exact test; P = 1.000). There were no statistically significant differences for prosthetic failures and complications between groups. Four months after loading, patients of the Fo1 group were less satisfied for function than those of the Fo2 group (difference between the medians [Hodges-Lehmann estimation] = 1; 95% CI: 0 to 2; P = 0.043). No differences were observed for aesthetics (difference between the medians [Hodges-Lehmann estimation] = 0; 95% CI: -1 to 0; P = 0.481), and two Fo1 patients would not undergo the same procedure again (difference in proportions: 0.2; 95% CI: -0.11 to 0.51; P = 0.474). Conclusions: Preliminary results suggest that immediately loaded cross-arch screw-retained fixed prostheses with 8 to 10 teeth can be supported by only one dental implant at least up to 10 months post-loading; however, the clinical application and usefulness of such a procedure remains questionable. Conflict of interest statement: Sweden & Martina, the manufacturer of the implants used in this investigation, provided free implants and prosthetic materials. However, data belonged to the authors and by no means did the sponsor interfere with the conduct of the trial or the publication of its results. Purpose: To evaluate the reliability of a conometric system for fixed retention of complete prostheses (CPs) on four implants after 5 years of function. Materials and methods: Twenty-five patients with a completely edentulous mandible received four implants supporting a CP. A total of 100 implants were immediately loaded with CPs on conometric abutments. A follow-up of 5 years was observed for each patient. Outcome measures were prosthesis and implant success, complications, probing pocket depth changes, marginal bleeding and plaque changes, and patient satisfaction. Results: One patient dropped-out. In total, 96 implants supporting the 24 CPs completed the follow-up examination at 5 years. No implant failed. Two framework fractures occurred after 4 and 5 years of function. No loss of retention was recorded for the CPs. Mucositis was recorded for two implants after 1 year of prostheses function for two patients, for one implant after 3 years and for two implants after 4 years in different patients and successfully treated with interceptive supportive therapy. No significant differences were found between Plaque Index (PI) at baseline and after 2 years (P = 1.0); similar findings were calculated between PI at baseline and after 5 years (P = 0.6) of function. At baseline, after 2 and after 5 years, respectively, 69%, 64% and 56% of implants showed a PI of 0; 31%, 36% and 44% of implants showed a PI between 1 and 3. Modify Bleeding Index (MBI) was not significantly different both between baseline and after 2 years of function (P = 1.0) and between baseline and 5 years of function (P = 0.5). At baseline, after 2 and after 5 years, respectively, 69%, 65% and 61% of implants showed a MBI of 0; 27%, 28% and 29% of implants showed a MBI of 1; and 4%, 7% and 10% of implants showed a MBI of 2. The mean probing pocket depth was 1.2 ± 0.4 mm at baseline, 1.2 ± 0.4 mm after 2 years and 1.4 ± 0.5 mm after 5 years of function. The differences were not statistically significant between baseline and 2 years (P = 1.0) and between baseline and 5 years (P = 0.1). From the patient satisfaction questionnaire, 85% percent of patients were satisfied from both aesthetic and functional points of view after 5 years of conometric prostheses function. Conclusions: The present implant-supported conometric retention system can be used to give fixed retention to a CP supported by four implants. An adequate metal framework should be provided to the definitive restoration in order to avoid fractures in the long term. Conflict of interest statement: No conflict of interest was declared by authors in the present study design and clinical application. No donation of free materials, prostheses or any other support was provided. This section presents a brief review of articles on dental implants considered of special interest to the reader, in order to encourage the development of research, data analysis and scientific publication. Your comments are welcome. Please contact Dr Michele Nieri at michelenieri@gmail.com.